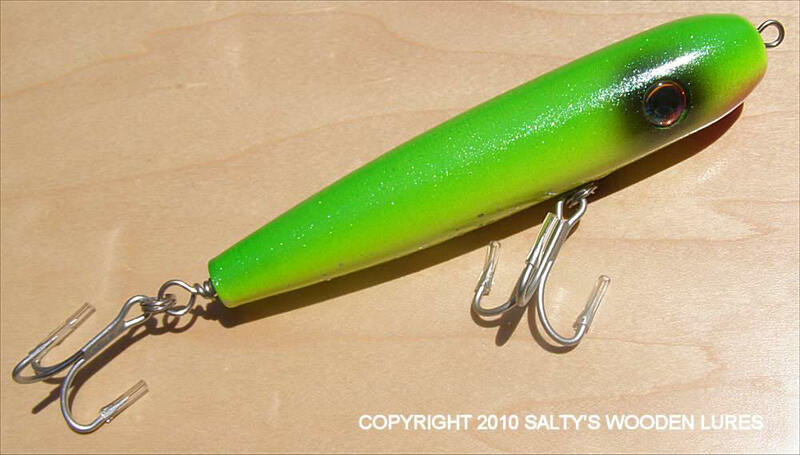 The Bay Stalker is a 6" dog walking/spook style lure, sealed against water for maximum durability, and hand painted. Weighted perfectly for optimum presentation, it will bob and dart back and forth with ease! It uses VMC Permasteel 4X strong 4/0 Belly hook, 4/0 Permasteel treble hook. 150 lb Rosco swivels and 2X strong 110lb Rosco split rings. Oversized Holographic eyes for maximum effect! Like all our lures, it has stainless steel hardware where possible and through wired for maximum strength! Perfect for stripers, or LARGE bluefish and other saltwater game fish! Proper presentation of this lure is to cast then twitch the rod tip up and down while retrieving, this will allow the lure to "wiggle" from side to side. Vary your retrieve, slow for stripers, faster for Bluefish or Tuna. I recently moved back to Cape Cod after being away for almost 30 years. I just happened to come upon your plugs and website by shear chance and am I glad that I did. I lived and fished on Cape Cod in the 60's and 70's and used mostly Atom and Gibb's plugs back then other than bait. I must say, that having bought one of your Bay Stalker Plugs was about the best thing I have done in some time. I only wish that I had known about your plugs when I lived in the Virgin Islands for our yellow fin fishing. I have been getting back into surf fishing, having bought a couple of custom Century long distance surf rods. 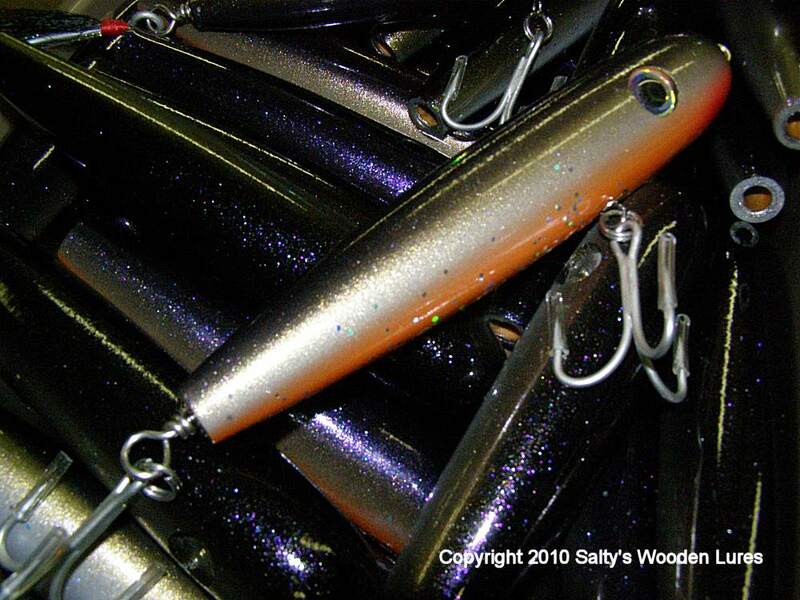 Your Bay Stalker plug is one of the best fishing lures I have ever used. 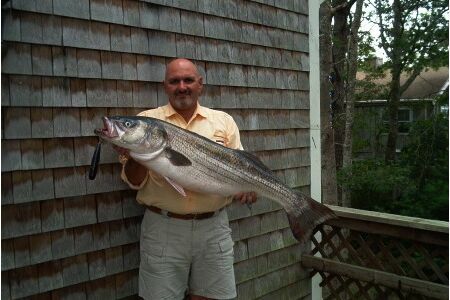 I have been fishing off of Sandy Neck Beach in Sandwich, MA and have been having excellent luck with the Bay Stalker. My best day to date, and I wish I had taken some pictures, was today. I landed five bass including two keepers up to 38". I was out casting everyone with the Century rods. Though I didn't catch the most fish, I certainly caught the largest and the only keepers. 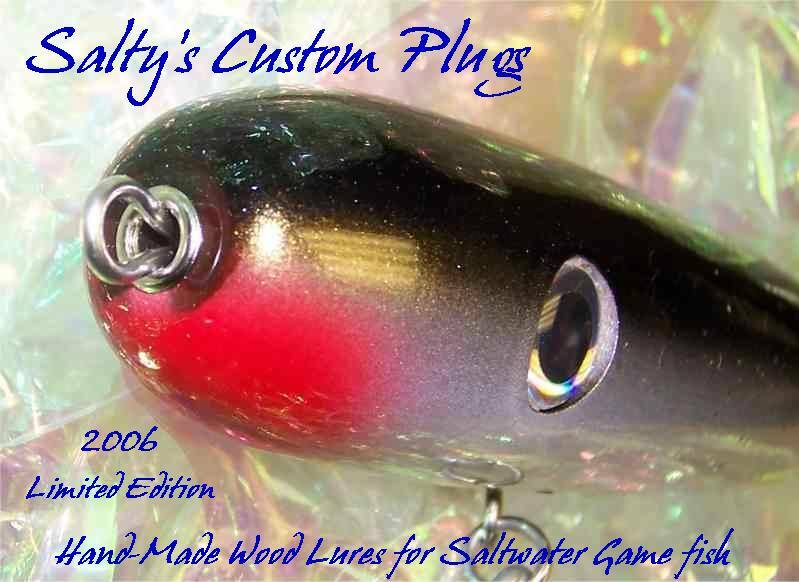 Your plugs are incredibly well built, I love the finish on them and the way they hold the fish when they strike. I had to play around with my retrieve until I got the action to match the fish but once I did, it was just hold on. Thanks from a very satisfied customer. I will certainly be buying many, many more of your line up of plugs over the winter. Best regards and tight lines." 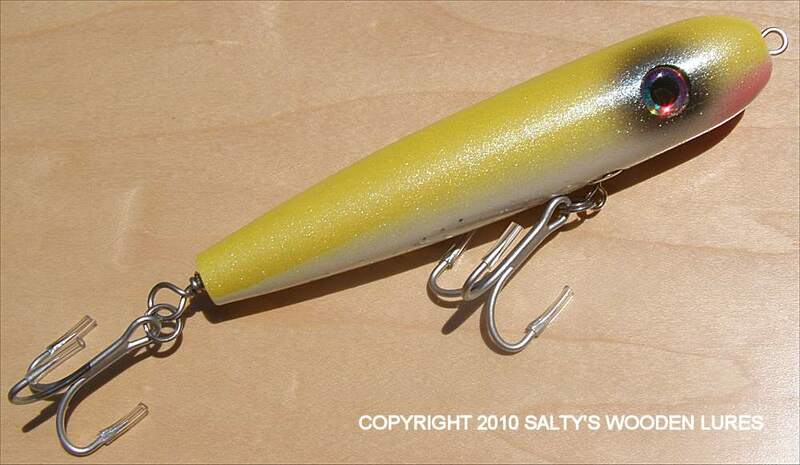 The Bay Stalker lure was so popular in 2006 that we decided to add it to the line in 2007. Stripers to 44 lbs and tuna to 120 lbs were among the impressive catches! Saltys is a small business and exempt from California Proposition 65 warning requirements, but choose to provide them voluntarily for known chemicals per California law. Wash hands after handling, DO NOT smoke or eat with contaminated hands! Keep away from children and do not ingest! USE COMMON SENSE!